Connie Robinson has beaten breast cancer but these days feels like a loser because taking time off from work to treat the disease led to her being fired -- twice. 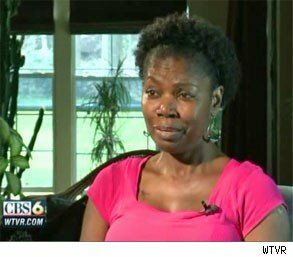 Robinson first learned that she had breast cancer in October 2009, when she was working for an undisclosed Richmond, Va.-area organization as an employment specialist, a TV station there reports. But in mid-December, just as she was winding up chemotherapy, she received a letter from her employer telling her that the leave she was granted under the Family and Medical Leave Act had run its course. "I worked even when I was sick and it's like it didn't matter," Robinson told WTVR. "You don't matter." Under FMLA, employees at firms with 50 or more workers can take up to 12 weeks unpaid leave to recover from illnesses that prevent them from working, and still return to their jobs. It's unclear how Robinson managed to use up 12 weeks of leave in the time from her diagnosis in October to her dismissal on Dec. 14. Robinson's attorney, Harris Butler III, didn't return calls from AOL Jobs seeking comment. It also isn't clear whether Robinson is suing or plans to sue her former employer. Robinson's love for her job made her dismissal all the more difficult. It was her "dream job," she said, and now someone else has it. Within a few months of her dismissal, Robinson, at the urging of her former employer, found a part-time position at a local nonprofit, the name of which also wasn't disclosed. But in May 2010, Butler found another lump in her breast and had to undergo surgery and chemotherapy. By fall, she was once again cancer-free, but her job, a temporary position, had been filled. Robinson once again found herself unemployed. Robinson's predicament raises questions about whether existing regulations are sufficient to protect workers dealing with serious illness. Butler, who specializes in employment law, told WTVR that protections granted workers under FMLA as well as the Americans with Disabilities Act give them some job security, but not enough. Further, Virginia has no statutes to protect such patients, according to the Richmond TV station. "If the employer wants to let you go, there's not a whole lot you can do about it," Butler said. Employers are under no obligation to go beyond the time frame stipulated under the law, said Frank Alvarez, a partner at Jackson Lewis, a White Plains, N.Y.-based employment-law firm that represents management. After employees have exhausted leave granted them under FMLA, it's possible that they may be entitled to additional time off under ADA, but only to deal with their own serious illness -- such as cancer. In Robinson's case, it's possible that the employer analyzed its obligations under ADA and concluded it had none, said Alvarez, who isn't involved in the matter. In an interview with AOL Jobs, Alvarez said that there is no "bright line" for when ADA might kick in. Rather, the law requires an "individualized assessment of whether additional job protected leave is a reasonable accommodation in that particular circumstance," he said. Other factors to be considered include whether the time off requested under ADA is definite or indefinite and the extent to which the employee's absence will impact the company's operations. Both ADA and FMLA have provisions that allow workers to contest dismissals should they feel their employers have fired them illegally, Alvarez said. Depending upon circumstance, employees have two or three years to appeal their discharges under FMLA, while ADA grants workers 180 or 300 days for appeal. Butler said that the window may be too short for many patients who find it difficult to file such claims while still recovering from illness. Robinson was unable to appeal either of her discharges because she waited too long to file her claims, according to WTVR. Still, her advice to workers with cancer who fear losing their jobs as she did is to stay focused on beating the disease. "Go through your treatment, fight through the cancer," Robinson said. "And then fight for your life."